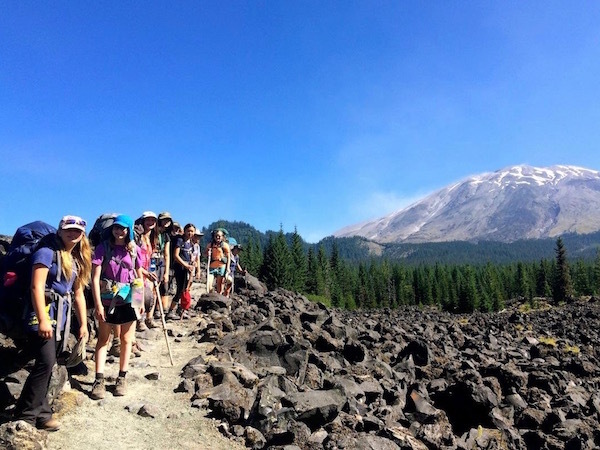 Alpengirl offers an adventure camp for girls in Oregon. The Columbia, Cascades & Coast Adventure is a 12 day overnight camp for pre-teen and teen girls ages 12 thru 14. This Oregon summer camp for girls begins in Portland, OR and includes 2 weeks of adventure travel and camping in southwest Oregon from Columbia River Gorge and Hood River to Astoria and Seaside before heading back to Portland for an end of camp celebration. The best part about joining in on a summer camp in Oregon with Alpengirl is our featured outdoor adventure activity; learning to surf in the Pacific NW! Sandy coves, headlands and curved beaches make northern Oregon a reliable surfing spot. The coastline here features small summer waves, gently sloped sandy beaches, and waves that break in shallow water which allows beginners to learn to surf in waist-deep waves. The Alpengirls will be decked out in wet suits and this makes the cold water a non-issue, plus with our aquatic ninja suits on we gain buoyancy, avoid board rash, reduce the risk of sunburn, and earn style points! There’s more to do in Oregon with Alpengirl Camps this summer! We’ll enjoy an awesome beach access campsite and the best 4th of July celebration on the beach with fireworks and new friends all around.